Take Current Affairs quiz January 29, 2019 to enhance your General Awareness. Practice with our esteemed Current Affairs quiz January 29, 2019 questions which covers all important events across India as well as World. Make use of all important Current Affairs quiz January 29, 2019 questions with answers updated here, at free of cost to succeed in all competitive Exams and Interviews. In which State is Kakinada located? Kakinada is one of the largest cities and the district headquarters of East Godavari district in the Indian state of Andhra Pradesh. Which Ministry granted Rs.50 crore to the University of Madras under phase 2 of the Rashtriya Uchchatar Shiksha Abhiyan? University of Madras received Rs.50 crore from the Ministry of Human Resource Development under phase 2 of the Rashtriya Uchchatar Shiksha Abhiyan. Which State is to utilise satellite imagery National Remote to continously monitor the forest cover? As a measure to save forest, Telanga govt has decided to monitor the forest cover continously. Who is the Managing Director of Cochin International Airport Limited (CIAL)? V.J.Kurian is the Managing Director of Cochin International Airport Limited (CIAL). Pinarayi Vijayan is an Indian politician who has served as Chief Minister of Kerala since 25 May 2016. How much did the Cochin International Airport Limited (CIAL) donate to the Chief Minister’s Kerala's Distress Relief Fund? CIAL donated Rs.10 crore for the Distress Relief Fund. The Kerala State govt. has initated effort to rebuild the flood-hit state under the Chief Minister's Distress Relief Fund (CMDRF). Which of the following BPCL's refinery project did the PM inaugurate recently in Kerala State? PM Narendra Modi dedicated to the nation an integrated refinery expansion complex of the public sector Bharat Petroleum Corporation Limited at the Kochi Refinery, Kerala. With which organisation did the Telangana Govt. rope with to get the satellite imagery to monitor the State's forest cover? As a measure to save the forest, the Telangana government has decided to monitor the forest cover continuously. For this, the State Government is planning to utilize satellite imagery. The State has accordingly roped in the National Remote Sensing Agency (NRSA) for providing high-resolution satellite images to enable it to keep a tab on encroachments, if any, in the forest areas. Who is the minister of Minority Affairs? Union Minister for Minority Affairs is Mukhtar Abbas Naqvi. The GST on Haj has been reduced from 18% to ______. The 18% Goods and Services Tax (GST) on Haj pilgrims by the central government has been reduced to 5%. Who launches 2020 Presidential bid ? Kamala Harris launches 2020 Presidential bid. Who won New South Wales men's Amateur Golf Championship ? Dr Poonam Khetrapal Singh is appointed as Regional Director WHO SOUTH EAST Asia. ------- entitled number one for cleanliness? Union Minister Patnaik launches Rs 1,100 crore Infra projects in ---------? Are you looking for right place to enhance your Knowledge on Current Affairs of 29th January 2019 through effective Quiz section? 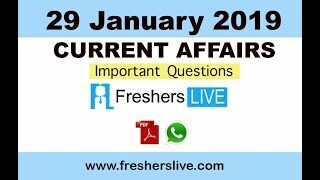 FreshersLive grants you the advantageous Current Affairs Quiz questions with accurate answers for 29th January 2019 which covers all the important events, supreme Awards, major occurrences in the National as well as World level. All important Current Affairs Quiz questions of 29th January 2019 are updated instantly in this page. Everyday at least 25+ Current Affairs Quiz Questions are displayed in this FreshersLive page. Correct Answer for each quiz question is given at the end of the entire 29th January 2019 Current Affairs Quiz questions section. You can estimate and upgrade your GK by attending these useful quiz questions. Entire quiz questions of 29th January 2019 Current Affairs covers Competitive Exam as well as Interview point of essentially important topics like International News, National News (ie. Indian Affairs), Science & Technology News, Environmental News, Bills & Acts Passed by Government, Defence News, About important Persons, Places, Banking & Economical News, Awards & Honours, Sports News, Revolutionary Updates on Arts & Culture, Obituary, Summits & Conference, Important Committee, Schemes, Appointments, Important Days & its Theme for Current as well as upcoming Year, Books & Its Authors, Agreements & MoUs, Budget, Taxes, Various Important Lists & Indexes, Visits by World Presidents, Prime Ministers, Political affairs and all Current Events. 29th January 2019 Current Affairs Quiz Questions updated in this page are prepared in the sense to help all aspirants to succeed in various Competitive Exams like UPSC IAS and other Civil Services Examination, Various Bank exams like IBPS PO, IBPS Clerk, SBI PO, SBI Clerk, RRB PO, RRB Assistant, Insurance exams like LIC AAO, UIIC Assistant, Railway Exams, Various Central Government Exams like SSC CGL, SSC CHSL, and more. Attempt all the Current Affairs Quiz Questions of 29th January 2019 and evaluate your score by matching your response with the correct answers mentioned at the end of this quiz questions section. By practising the FreshersLive Current Affairs Quiz Questions on a daily basis, you can surely succeed in the competitive exams as well as the interviews easily. Make use of this ultimate resource to the fullest and quickly achieve your goal!